Some instruments or classes of instruments are particularly known for their capacity to create acoustic musique concrète. Think of the low strings—especially the double bass—and their rich overtone structures, stolid materiality and deep resonance, all of which have allowed adventurous performers to explore an expansive and sometimes quite otherworldly palette of sound. Less associated with this type of sound exploration perhaps are the brass instruments. To the extent that this perception holds, Norwegian trombonist Henrik Munkeby Nørstebø is out to challenge it. Trained in jazz and improvisation at the Gothenburg and Oslo music academies, Nørstebø seems to take a holistic approach to his instrument, one that encompasses its full range of dynamics as well as the different voices available to it. As an instrumental personality, the trombone can be brassy and broad; Nørstebø doesn’t evade this side of it, but he does also manage to elicit a quieter, more abstract side: he reveals the trombone’s secret life as an introvert. Both sides of the instrument are explored on the first of the album’s two tracks, Sources of Internal Heat, for solo acoustic trombone. Introducing the piece with several long C# notes separated by silences, Nørstebø proceeds to build timbres marked by a low-buzzing, rough flutter, contrasts of register, beats and multiphonics, and dynamic variations. Abstract sounds bordering on the quasi-electronic have a place as well, but so do legato melodic fragments and voice-like microtonal drifts and glissandi. 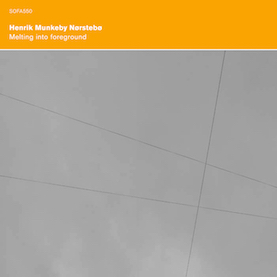 The second track, Melting into Foreground, brings in the prerecorded sound of Nørstebø on half-clarinet, which is multiplied and overlaid into irregular relationships with itself. Like the first track, this one trades in sonic ambiguities. Sounds of rumbling and static, or apparent birdsong and feedback can sometimes be traced to their sources in the acoustic trombone or in the manipulated recording—and sometimes not. The effect is acousmatic but unmistakably rooted in the recognizably musical. Source: Prog Sphere, a very early tour announcement. King Crimson will be touring Europe next year. The band return to Aylesbury once again but from there will play countries not included in the 2015 itinerary. It will be the first time King Crimson have performed in Germany, Czech Republic, Poland, Denmark and Norway since 2003. This music is a follow up to Joel Harrison’s first large jazz ensemble recording from 2013, Infinite Possibility. Each of the six pieces explores the intersection of dance grooves with unusual orchestration, improv, and surprising compositional twists and turns. It aims to cajole, inspire, provoke, entertain, and enlighten…. Tristan Perich: Three Improvisations Tristan Perich will perform three improvisations using piano and 1-bit electronics. Video artist Ursula Scherrer together with Shelley Hirsch (voice) and MV Carbon (cello and synthesizer) will stretch, pull, distort and expand the boundaries of image, sound and space to reach to that which is beyond…. Yoshimio and Ikue Mori met in the 80’s in Osaka, and have been involved together with different projects throughout the decades. Twindrum is project that started in Brooklyn in 2013, and performed in Japan in 2014…. New works from two renowned composers from the AACM: Wadada Leo Smith presents “Voice, Strings, & Vibraphone Looking For the Most Refined Beauty” and “Henry David Thoreau’s Civil Disobedience 1849, Six Ideas”, featuring A Secret Quartet (Corneilus Dufallo, Jennifer Choi, Lev Zhurbin, Yves Dharamraj), Bobby Naughton, Thomas Buckner, and others. Douglas Ewart presents new music for a new ensemble…. Bérangère Maximin presents Siklon Sound objects, microphonics, digital chimeras. Bérangère Maximin’s music engages the listener in considerations of space and textures. Since her debut album, Tant Que Les Heures Passent on Tzadik (2008), she has gradually developed a hyper-personal style, creating sensual, hypnotic, sultry pieces with immediate impact. The electroacoustic composer’s repertoire is marked by encounters that have inspired her writing in various degrees…. Roulette presents two nights of Henry Threadgill’s Double-Up ensemble as he personally honors the 50th Anniversary of the AACM. Peter Evans has convened a new quartet of wind players for a premiere performance of collaborative music. Steve Lehman (saxophones), David Byrd-Marrow (french horn) and Anthony Orji (bass clarinet) will work with Evans, composing new structures for improvisation and sonic exploration. The all-wind instrument format is a rare one; the group will seek to both explore and break the limits imposed by breath sustained instruments, with each member of the group contributing his own unique voice and timbral approach to create a hybrid and ultra dynamic music…. As the longest night of the year unfolds, and the journey of our planet nears the point when Winter commences in the Northern Hemisphere, join us for Phill Niblock’s annual Winter Solstice concert: six sublime hours music (acoustic and electronic) and mixed media film and video in a live procession that charts the movement of our planet and the progress of ourselves through art and performance at is maximal best….